Hibiscus Gel is more convenient to use but has a short life and must be used within a short period especially after opened. Ingredients: Contains 100% Pure and natural Hibiscus flower in pure gel form or finely ground powder form with absolutely no chemicals and additives. Extracted from the hibiscus flowers, this is a nature's gift for all hair treatments. 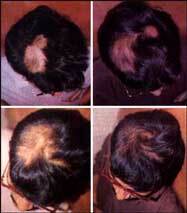 Effects: Helps reduce and prevention of graying, balding, hair-loss, dandruff, split-ends, and many scalp disorders. Excellent natural conditioner. Usage (for powder form): Slightly wet the scalp first. Take a cotton pad or cotton ball and apply the paste all over the scalp starting from the roots. Try to reach the entire scalp and then gently massage for a couple of minutes. If you have split ends, apply paste to the ends of the hair. Leave it for 30-40 minutes. Let it completely dry and then simply rinse it off in shower. Usage (for gel form): This gel could be used directly on the hair. Apply all over the scalp starting from the roots. Try to reach the entire scalp and then gently massage for a couple of minutes. If you have split ends, apply gel to the ends of the hair. Leave it for 30-40 minutes. Let it completely dry and then simply rinse it off in shower. Hibiscus Gel is also an excellent natural conditioner.